Born in St. John, N.B., Fr. Bonner came to Alberta in 1956. His first parish appointment was in Castor, Alberta. He came to Edmonton to the Sacred Heart parish in 1957, and moved to St. John the Evangelist in 1959. In 1960, he moved to St. Anthony’s Parish, and served there for the next eleven years until his untimely death from a heart attack, at the age of 45. Fr. Bonner was also the chaplain at the University of Alberta Hospital for 10 years. Fr. 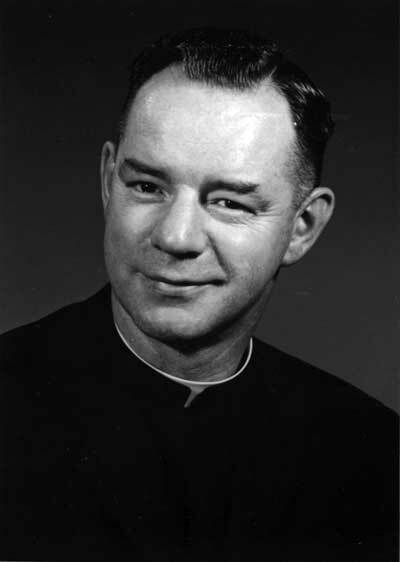 Bonner was a driving force behind the Knights of Columbus minor hockey program, being appointed the Church’s representative on the Knights of Columbus Hockey Board of Governors in 1960. At the time of his death, the Knights of Columbus minor hockey program embraced 153 teams with approximately 2000 boys playing in various league competition. As well as providing guidance to the successfully large hockey program, Father Bonner was involved in scholarships for young players. The scholarship program included boys from other athletic clubs and was carried out through universities such as Denver, Michigan Tech, Brown (Rhode Island), Harvard, and Wisconsin State. To honour this outstanding Chaplain, the Knights of Columbus Hockey Board Of oovernors established the Fr. Bonner Memorial Fund which lead to the eventual construction of the Fr. Bonner Arena. It is in memorial of this great man, that our Knights of Columbus Council #7599, chose its name, Father Bonner Council. The Fr. Bonner Council emblem includes a hockey stick within a puck.